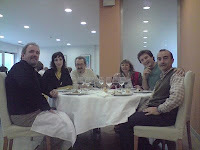 José Luis Fernández and us in Leioa. Ready to eat in the famous university restaurant. Very far from Argentina but near from Galicia. From left to right: José Luis, Ainara, Jotxo, Karmen, Gotzon and me.